Land Slide in Siang and Darjeeling occurred due to torrential rains in the past few days. The heavy rains triggered landslides and route from Aalo to Pangin was blocked at 5km off Sangam point, informed Siang Deputy Commissioner Rahul Singh. JCB was pressed into service to clear debris but landowners of the area obstructed, threatened the workers and demanded compensation, yielded no progress today. Meanwhile, DC Singh along with ADC and EAC Pangin visited the landslide-hit area on Tuesday to assess the extent of damage. He interacted with TK Engineering officials and directed them to put more men and machineries to carryout restoration work tomorrow. He further assured to extend help and support from his administration to TK Engineering and directed to bring the disrupted traffic back to track by 3 pm, tomorrow. 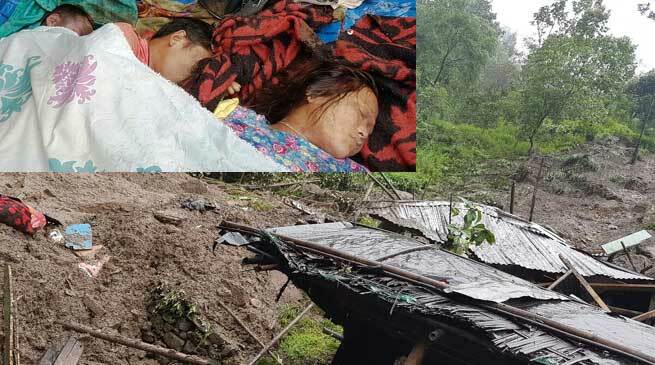 On the other hand three members of a family were killed, in Fincheytaar, Gairigaon in Darjelling district of West Bengal, when landslide struck their house due to insistent rain last night. Fincheytaar is on a steep hilly slope above Nippon Micro Hydro Project near Basbotay on the way to Mishima.